I might have mentioned one of my best friends to you before. In case you are new or you missed it, I have two best friends who have been with me through thick and thin for over a decade. Shannon has a passion for history (except American history, she loathes American history); she lives the closest so we attempt to get together as often as we can, but having opposite work schedules makes it difficult. Holley lives around the DC area; she’s the more outgoing one of us three and doesn’t hesitate to start a conversation with anyone. We have similar interests in all things Tolkien, comics, cosplay (at least for me and Holley, Shannon just admires), and cuddly things (we can never go anywhere without all of us buying the same plush animal). Holley often asks me to make her things since she shares my cosplay love but isn’t a crafter (she wants to be but finding time is difficult with her work schedule). 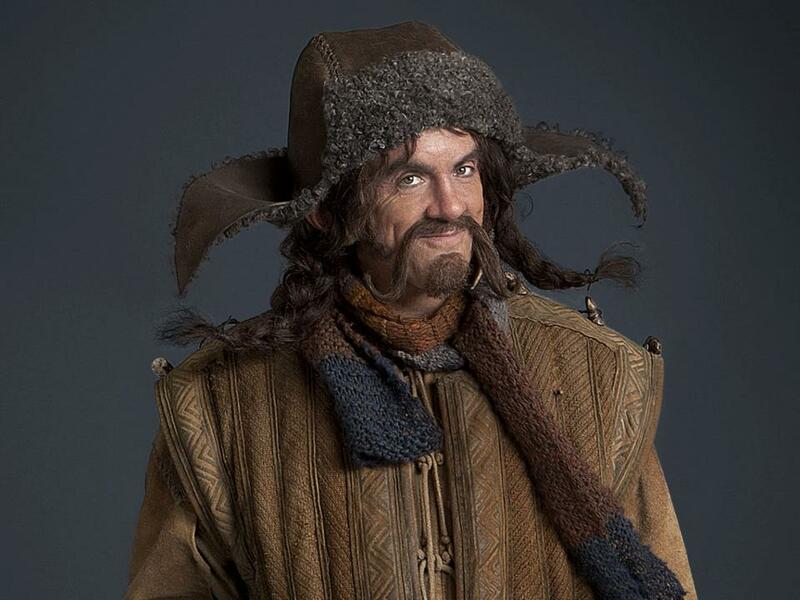 Recently, due to the cold weather, she asked me to knit her Bofur’s scarf from The Hobbit movies. I was reluctant at first because scarves take so long to knit. But after finding a suitable pattern that was simple, I agreed. Weta has a knitting kit using the Stansborough yarn (the knitters for the movies). However, I have heard the scarf is knit at a ridiculously loose gauge doesn’t hold it’s shape. Plus the kit isn’t cheap. Instead, I went with a simpler pattern on Ravelry and Knit Picks City Tweed DK yarn in Porpoise, Obsidian, and Blue Blood. The scarf is all garter stitch on size 11 needles. It was so easy and quick I found myself done in three days…and with two extra skeins of each color left over. Not one to waste yarn, I decided to knit two more scarves for myself and Shannon. I loved the loose gauge and light airy feel of the scarf while knitting, and I don’t have a light spring scarf that isn’t made of cotton or polyester. Also, Shannon had a birthday coming up so what better gift? After washing and stretching, I sent the scarves off. Both Holley and Shannon loved their scarves; Holley loved it so much she all but demanded we bring the scarves to her wedding for a photo…which is in September. 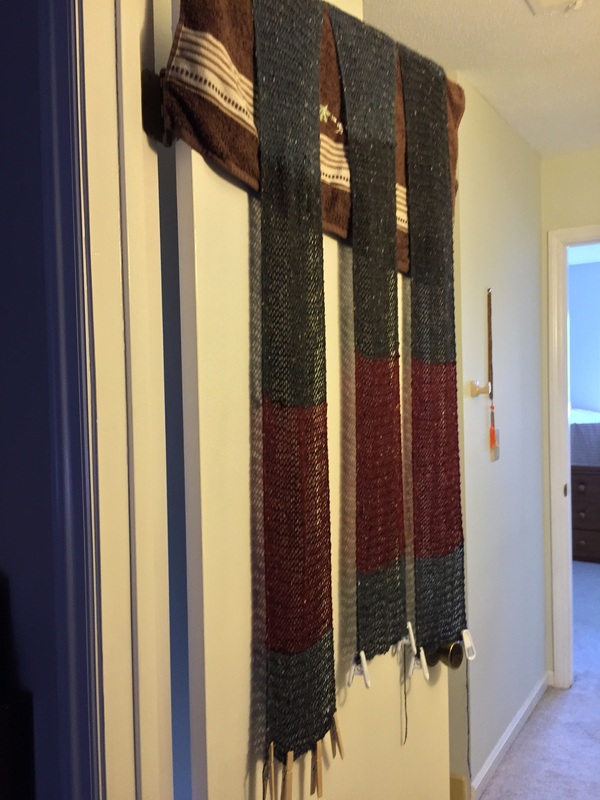 Until then, this is the only photo I have of the scarves hanging over my bathroom door to dry. I wear my scarf every day. For something at such a loose gauge, it is surprisingly warm and not as bulky as some of my other scarves. Because of the neutral-ish colors, it goes with everything. I think this may be one of my best knitting projects ever.